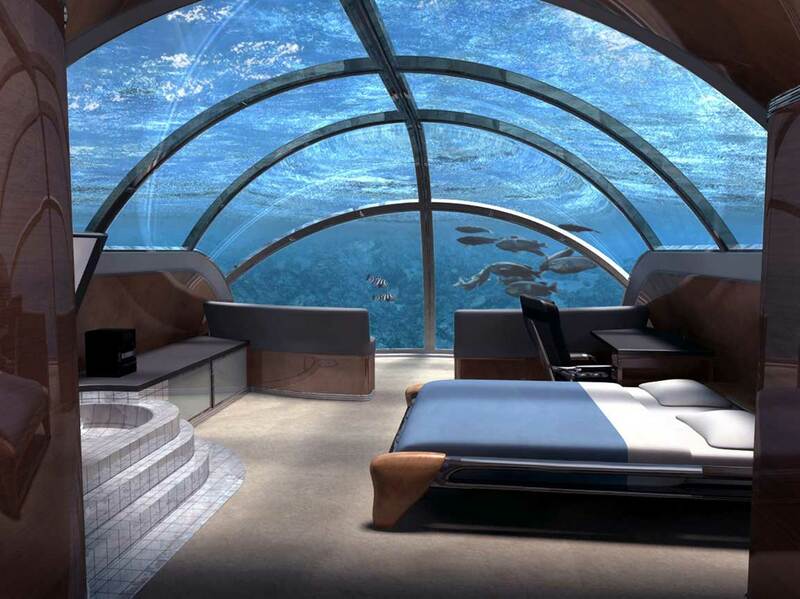 Jules Undersea Lodge is 21 feet under the ocean's surface, and you'll enter the lodge through an opening in the hotel floor. Originally an underwater research laboratory, the lodge rests in a mangrove lagoon, which serves as a natural nursery for reef fish like parrotfish, snapper, tropical angelfish, oysters, and anemones. Guests at the lodge are allowed an unlimited number of tanks for the hotel-provided scuba gear. For 189 euros a night, you can have the luxuries of camping without the hassle of putting up tents. 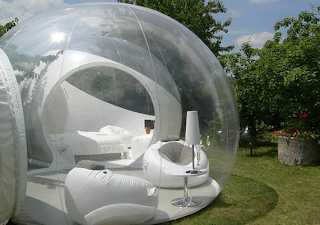 Designed by Pierre-Stephane Dumas, each bubble in the Bubble Tree Hotel is continually filled with fresh air to keep it inflated, refresh the air supply, and cut down on condensation. Because the bubbles are transparent, you can enjoy the waning evening light and sleep out under stars you can actually see without the obstruction of a canvas tent. 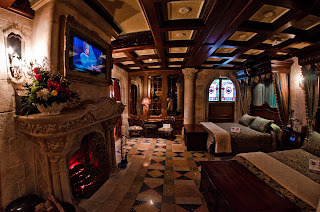 Located on the 4th floor of the Cinderella Castle in Walt Disney World's Magic Kingdom, the Cinderella Castle Suite is decorated like the 17th century chateaus that the castle itself was modeled after. Stained glass windows, dark woods, and ornate stone carvings make the 650 foot space enchanting, and the magical theme is even carried over to the TV, which is masked by a portrait of Cinderella herself. Near the Lake Garda theme parks in Gardaland, Italy, the Hotel Parchi Del Garda is the first 4D Avatar hotel, and boasts 4 theme rooms with Hollywood-grade animation and special effects. Experience a merchant pirate ship or an African safari, interact with the Spirit of the Lake in the Aki cave, or lie in green meadows with flowers that bloom in the morning. This chic (and pricey!) hotel in Paris uses the art of fragrance to heighten guests' experience in each of their themed rooms. ONE By the Five lets guests choose from 5 scents: Vanilla Honey, Tonic Touch, Relaxing Touch, Sensual Touch, and Natural Touch. The room in this particular image makes you feel as if you're sleeping on a cloud. 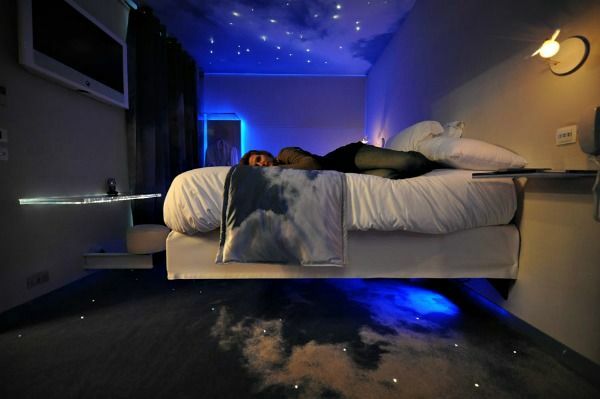 The bed appears to elevate off the floor, while clouds and the stars in the Milky Way glow overhead and beneath your fluffy bed. Hidden in the heart of the Huilo Huilo nature reserve in southern Chile, the four-star Magic Mountain Hotel looks like something out of a fantasy novel. Play mini-golf through a winding, wooded course 40 feet above the forest floor, relax in a hot tub that's carved out of a giant tree trunk, or enjoy a glass of wine at one of the best restaurants in southern Chile. 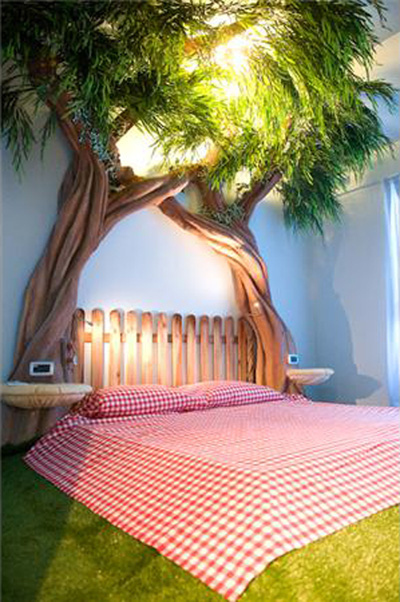 This hotel in Phuket has designed theme rooms just for kids, including three adventure themes: the Outer Space room, the Underwater Room, and the Castle Room. The kids rooms also have DVD players, 32" televisions, and Playstations. 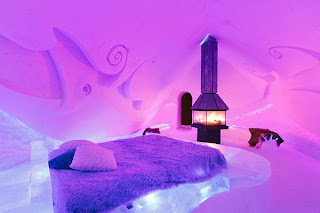 The Ice Suite at the Hotel de Glace is designed to give guests a Nordic experience and is open from the first week of January until the last week of March. Because the hotel has to be rebuilt every year, the layout and design of each room varies from season to season. Choose from a regular room, a theme suite, a premium theme suite with a fireplace, or a premium deluxe suite with a fireplace and private spa. Guests can also enjoy the outdoor spas and sauna during the evening from 9 p.m. to 9 a.m. Don't worry, you won't spend your vacation shivering here. The snow walls keep the interior well insulated, and the hotel provides arctic sleeping bags as part of your bedding in the evening. With no more than a 30-guest occupancy cap, the Maravu Plantation and Beach Resort in Fiji offers a tranquil, intimate escape from the mundane and troublesome. 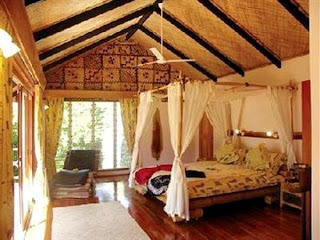 Guests stay in private, air-conditioned "bures" that are partially secluded with lush, tropical gardens. The Treehouse Suite is by far the most amazing, with sprawling decks, open-air showers, jacuzzi spa, and complimentary packages that include 2 massages, Fijian sarongs, a half-day trip to the Bouma Waterfalls, and a half-day tour of the coast. If you need a little color in your life, you should stay at the Panic Room at the Au Vieux Panier Hotel! 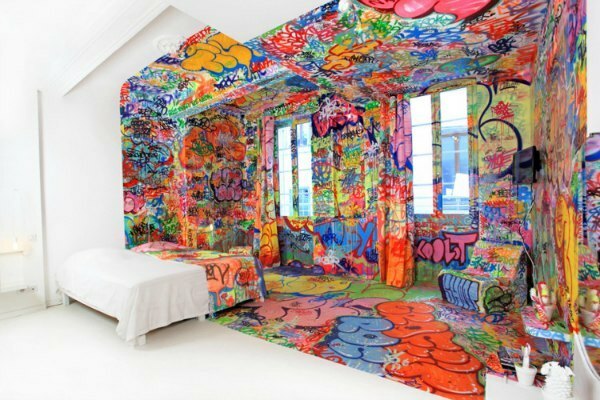 This room, which was designed by the artist Tilt, is brightly colored on one side, and a blank slate on the other. This Karl Lagerfeld chocolate hotel room is the eccentric designer's latest creative venture. He teamed up with Magnum ice cream and chocolatier Patrick Roger to create a chocolate hotel suite at La Reserve in Paris. The entire suite is made from chocolate, including its carpet, headboard, book-filled nightstand and occupant -- Lagerfeld's companion and muse Baptiste Giabiconi, who is depicted eating a Magnum ice cream bar. 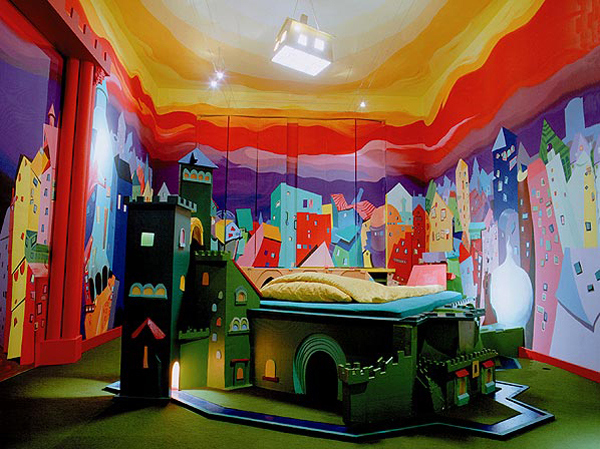 Any kid or kid at heart would love staying in the Castle Room at the Propeller Island City Lodge in Berlin! Not only do you get to sleep in a castle-shaped bed, but the room is filled with your very own miniature golf course. 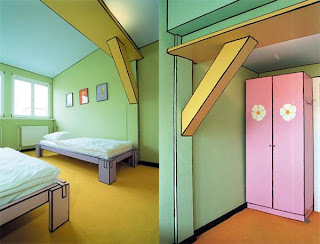 The room was designed by Germany's Lars Stroschen. 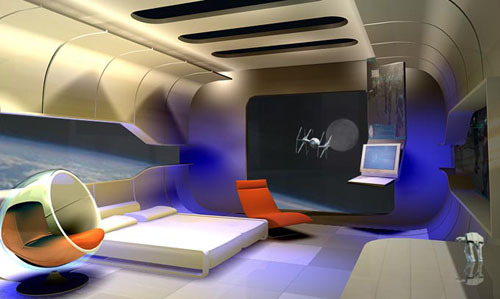 This fun room at the Arte Luise Kunsthotel in Berlin, Germany is based on a classic Sega Dreamcast game. The design is by comic artist KEHL, who is based in Berlin. As a nature lover I would love to stay in the Giraffe Manor - although all the hotels listed look pretty incredible. 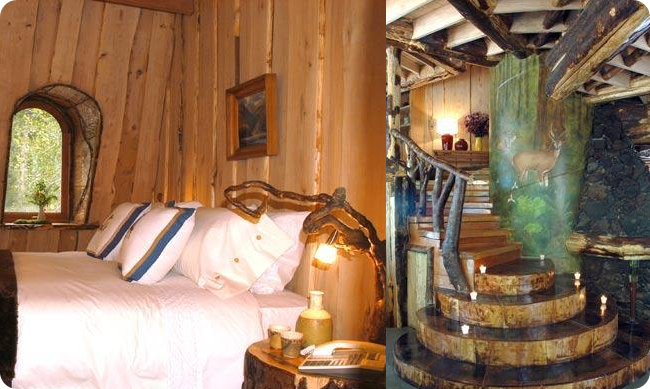 Great hotel, has a great room and lovely decoration! Very homey! Loved the review! I do wish the Chocolate Room was bigger thought.